What's the deal with Fiji Water? 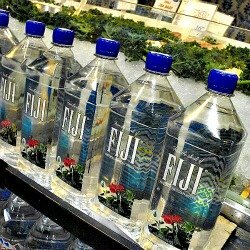 Find out the good and the bad about the controversial American Fiji bottled water company. Fiji Water is an American company which extracts artesian water from the main island of Viti Levu in Fiji. The company was started by a Canadian entrepreneur David Gilmour in 1996. He also bought and developed the island Wakaya (read up in our Islands For Sale section) in Fiji. Fiji Water was then bought by controversial American billionaires Stewart and Lynda Rae Resnick in 2004. In 2010, it acquired JUSTIN Vineyards & Winery in America. Institute in his "Fiji Water: Where bottled water, money, and ethics conflict" article, bottles and packages 3.5 million litres a month to overseas markets predominantly in the U.S. which then in turn is sold for $3-4 a litre. Fiji Water (sometimes misspelt Figi Water), as Peter Gleick states, contributes 20% to Fiji's exports and 3% to it's gross national product. A significant contributor indeed. It also provides a reported 350 jobs for locals. The company said that it paid $1.3m in royalties in 2008 to a string of local good causes, including schools, health care clinics, and in providing clean drinking water. The company gets the water from a Fijian aquifer, bottled in a diesel-fueled factory with plastic shipped from China, then transported thousands of miles all over the world. 53% of Fijians don't have access to safe clean drinking water. Yet millions of litres of water are exported for huge corporate profits. As Peter Gleick wrote. 'The economic disparity between corporate revenue and local returns is beginning to cause social disruptions and disputes in some regions.' Americans have greater access to Fijian water than Fijians do. According to the Fijian Prime Minister Bainimarama, the Fiji bottled water company has enjoyed a huge corporate tax holiday for over a decade, paying less than a million dollars in total corporate tax over the past two years, despite earning hundreds of millions in revenue from sales. It's the second time that when the government intended to raise tax on bottled water, it threatened to close the bottling plant down. A lot of people are questioning the reason for buying bottled water. Why would you buy bottled water for $3-4 when you can access tap water for literally thousand's of times less? Or locally produced bottled water for a fraction of the cost? Not to mention the carbon footprint for bottling natural water, and also for transporting it over thousands of kilometres. Some would argue that Fiji Water is the embodiment of waste.